Heygate Estate, Elephant and Castle. Flickr/Steve Cadman. Some rights reserved. Over the weekend of 13-14 June of this year, three Lambeth housing estates earmarked for regeneration, Cressingham Gardens, Central Hill and Knight’s Walk, hosted Open Garden Estates, an event organised by Architects for Social Housing (ASH). Founded by architect Geraldine Dening in order to respond architecturally to London’s housing crisis, ASH is a collective of architects, urban designers, engineers, planners, academics, theatre directors, photographers, writers and housing activists operating with developing ideas under set principles. First among these is the conviction that infill, build-over and refurbishment are more sustainable solutions to London’s housing needs than the demolition of the city’s council estates – enabling the continued existence of the communities they house. ASH offers support, advice and expertise to residents who feel their interests are not being represented by local councils or housing associations during the regeneration process. ASH’s primary responsibility is to existing residents – tenants and leaseholders alike; but it is also committed to finding viable alternatives to developer-led regeneration – alternatives that are in the interests of the wider London community. This term is used in urban planning to describe former industrial land, often contaminated by hazardous waste or pollution, that requires ‘cleaning up’ before being used for new developments. Greenwich Peninsula, once the site of the largest gasworks in Europe, is an example of such a site currently being redeveloped by the Hong Kong investment company Knight Dragon. In the Adonis report, however, the contaminants that require cleaning up are the hundreds of thousands of Londoners that currently live on what it estimates are the 3,500 housing estates in Greater London. When employed to describe their mostly working-class residents, already demonised by a concerted campaign in our media and entertainment industries, this language of waste and pollution has dark parallels with the discourse of degeneracy and disease employed in ethnic cleansing. It is not hyperbole to describe these plans as ‘social cleansing’. 50,000 London families, upwards of 150,000 people, have been forcibly deported from their boroughs in the past three years: some to outer boroughs, most out of the city altogether, to Manchester, Bradford, Hastings, Pembrokeshire, Dover and Plymouth, all to make way for up-market developments far beyond the pockets of the local communities. The Adonis report, produced for the Institute of Public Policy Research (IPPR), was sponsored by the Peabody Trust, one of the housing associations to which the report recommends councils transferring their ‘stock’; so its claims for ‘independence’ are as creditable as its description of planned new developments as ‘affordable.’ It sets out very clearly what will potentially mean the demolition of every housing estate in Greater London. Yet in a report inundated with arguments about the prohibitive cost of refurbishment against the financial viability of redevelopment, not once does it mention how many hundreds of thousands of Londoners will be evicted and made homeless by its socially and architecturally regressive dream of ‘City Villages’. If we are to judge by the speech Brandon Lewis gave to the London Real Estate Forum following his appointment as Minister of State for Housing and Planning, these proposals have already been taken on board. Behind his concern for tackling, as he put it, ‘the deprivation that blights the lives of residents in these estates’, the Minister plans an unprecedented land grab for his backers and financiers in the building industry. The terminology, justifications and tactics expressed in his speech are drawn lock, stock and eviction notice from the Adonis Report, showing that the latter’s suggestion that London’s housing estates be recategorised as brownfield land will shortly become government policy – if it isn’t already. The Chancellor’s emergency budget outlined his intentions to introduce stronger compulsory purchase powers over brownfield land, as well as devolving planning powers to the London Mayor. And yet, who has heard about it? The mainstream press won’t touch the truth about estate regeneration. With the occasional exceptions, when housing is raised in the press it is in order to reinforce in the minds of readers the presiding image of run-down sink estates as havens of crime and anti-social behaviour that has little in common with the strong communities that live there. If some council estates require refurbishment, it’s because they have been systematically run down by the withdrawal of essential maintenance by councils and housing associations over many years. Yet even this is not a genuine reason to recategorise people’s existing homes as brownfield land, as there is no intention of replacing them with new homes their current tenants could possibly afford. The stereotype is false not only in its description of council estates but also in its use to further a very different agenda to the one in whose service it is being employed. PRP, the architectural practice chosen by Lambeth for the redevelopment of the Ted Hollamby-designed Central Hill estate, adopted this tactic when they began their supposed consultation with residents by publishing a photograph on Twitter of a walkway at night with the exclamation: ‘Would you walk down this alleyway!’ The article on Open Garden Estates for The Independent on Sunday was cut in half on publication, presumably by an editor scared of the potential financial implications to London’s property-owning classes. And a version of this article, commissioned by the Architects’ Journal in response to the Adonis report, was so cut by its editors, who removed all reference to the political motivations behind its proposal, that ASH was forced to withdraw it from publication. First some lies. In the Newspeak of our Orwellian times, ‘regeneration’ means redevelopment. This was confirmed by Matthew Barnett, Lambeth’s Cabinet Member for Housing, when at a meeting with residents of Knight’s Walk he defined regeneration as ‘building to a high density in order to have more homes for council rent to address the housing crisis.’ However, the redevelopment of housing estates is not driven by the desire to address the housing needs of people on council waiting lists, as is repeatedly put forward by councils, and not only Lambeth’s, unable to provide even projected figures for how many new homes at social rent will be generated from the ruins of the current council homes. Contrary to what residents are told by politicians, borough councils, housing associations and the architectural practices in their employ, the last thing on the minds of property developers is re-housing tenants on council rental rates – not when the land their homes sit on is some of the most valuable in the world. Nor is the choice to demolish existing estates driven by the punitive costs of refurbishment – not when the eviction, demolition and redevelopment of the Heygate and Aylesbury estates, both models of ‘regeneration’, will cost many times more than they would have to refurbish and maintain. 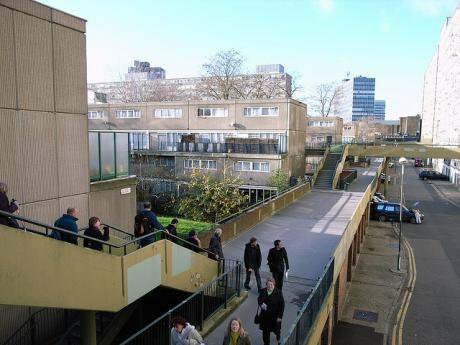 The Six Acres estate in Finsbury Park, built at the same time as the Heygate and Aylesbury by the same contractors using the same system, was refurbished by Islington Council in 2012 at a cost of around £10,000 per dwelling. This is many times less than the projected £60,000 per dwelling Southwark Council is spending on emptying, demolishing and redeveloping the Aylesbury estate. So, what is driving estate regeneration? Our belief at ASH is this. In addition to the enormous economic incentives for property developers, housing associations and financial investors eager to profit from London’s exorbitant land values, the policy of demolishing London’s housing estates is also the keystone in this government’s crusade to dismantle the welfare state built by Labour after the Second World War. It is clear that the Tories want to erase everything the housing estates of the 1960s and 1970s stood for – the NHS, state benefits, pensions and education, publicly owned utilities, transport and industry – everything, in fact, that might remind the people of Britain that there is another social contract than the one currently being forced upon us. To this end, not only must the greatest source of working-class housing in London be reduced to rubble and their often significantly lower quality replacements priced at a level few Londoners – let alone working class Londoners – will be able to afford, but the very concept of council housing must become impossible to imagine again. These plans, which are already a reality, to evict an entire class of people will see the greatest change to the topography and demographics of London in generations. Given the uniform adoption of this neo-liberal agenda by all parliamentary parties, it is hardly surprising that the largest assault on social housing is being pursued by Labour councils; or that the architect of this policy, the Labour Peer Lord Adonis, was himself raised on a Camden council estate. In 1979 the Czech novelist Milan Kundera wrote: ‘The struggle of man against power is the struggle of memory against forgetting’. It is vital to the living future of London and Londoners that we remember a vision of social housing whose planned erasure from the cityscape is the blank canvas of memory on which the housing commodities of the present are being built. So, what can architects do? 1) We propose architectural alternatives to estate demolition through designs for infill, build-over and refurbishment. The plans being drawn up by ASH for Knight’s Walk, Cressingham Gardens and Central Hill, designed in consultation with residents, are examples of such proposals. 2) We disseminate information that aims to counter negative perceptions about social housing in the minds of the public and relevant interest groups using a variety of means, including protest. The protest and accompanying manifesto with Fight4Aylesbury at the recent AJ120 Awards was an example of such an action. Cressingham Gardens, in Brixton, held Tenants and Residents Association-guided tours of the communal gardens, while ASH facilitated a workshop with residents on the potential redevelopment of blocks of flats that have stood empty and bricked up for sixteen years. Save Central Hill Community, in Crystal Palace, held a barbeque on the slopes that surround their sports and playground facilities, a grass amphitheatre on which over a hundred residents and visitors discussed their campaign between guided tours of the estate’s communal green spaces and private gardens, all of which had been especially opened for the weekend. Hands off Knight’s Walk, a much smaller estate in Kennington, opened several of its unique interior courtyard-gardens to the public for guided tours that culminated with a talk delivered by Kate Macintosh, who was celebrating the recent listing of Leigham Court Road. The success of Open Garden Estates should be measured not only by the number of people who visited the individual estates, but also by how the respective communities made the event their own and employed it to galvanise residents in the struggle to save their homes. By both these measures, Open Garden Estates was a success. ASH intends to pursue this and other initiatives with estates facing the threat of demolition across London, and to target architectural practices that collude in the social cleansing of the communities they house. We welcome those of you who reject this role to join us and help in finding a solution to the housing needs of Londoners. Two long, sustained and informative articles about London’s housing ‘crisis’ have been published recently: Oliver Wainwright’s ‘Revealed: how developers exploit flawed planning system to minimise affordable housing’, and Rowan Moore’s ‘London: the city that ate itself’. Both are well-argued and fairly objective investigations into what they are united in depicting as the inexorable economic logic and political causes of the current situation. However, in neither article will one find more than the slightest hint towards solutions to the problems they spend the remainder of their many pages analysing. Far from compelling outrage and a willingness to combat these forces in the reader, it might be argued that these articles serve precisely what they claim to be exposing, by painting what is contingent as somehow given, irreversible and unchallengeable. This, it bears being repeated, is precisely the function of ideology: to make existing economic and social relations seem part of the natural order of things. But there is nothing natural, necessary, inexorable, irreversible or unchallengeable about what the property barons, politicians and investors feeding at the housing table are doing to our city. London’s housing ‘crisis’ is not a result of abstract faceless economic forces: it has been carefully prepared and legislated over a number of years to serve the interests and fill the pockets of those who benefit from it. If by ‘crisis’ we mean something that is out of our control, then there is no housing ‘crisis’. There is – in actuality rather than in the ideology of our society – a class war being waged through housing, and so far it is all going to plan. The so-called ‘crisis’ is well in hand. The sooner liberals with an unshakeable faith in democracy, market forces, common sense, human decency and all the other illusions of their political class wake up to this reality, the sooner we can start coming up with ways to fight back. We can start by stopping doing what these articles perhaps unwittingly perpetuate, which is analysing this so-called crisis in the terms put forward by those that created it – of profit-incentives and market forces, deregulation and financial viability – as if this were the ground we should be fighting on. It isn’t. An enemy that is free to choose his own ground has already won half the battle. We need to start putting forward our own terms, choosing our own ground, rather than fighting for the scraps our masters let fall from their table. Only then will we be in a position to win this war. Then we need to get out there and win it. ASH's website can be accessed here.